WalkDenver - Slow the Funk Down! Help us raise funds to print additional "Slow the Funk Down" yard signs! Each sign sends the message that Denverites want safer streets and more livable neighborhoods. 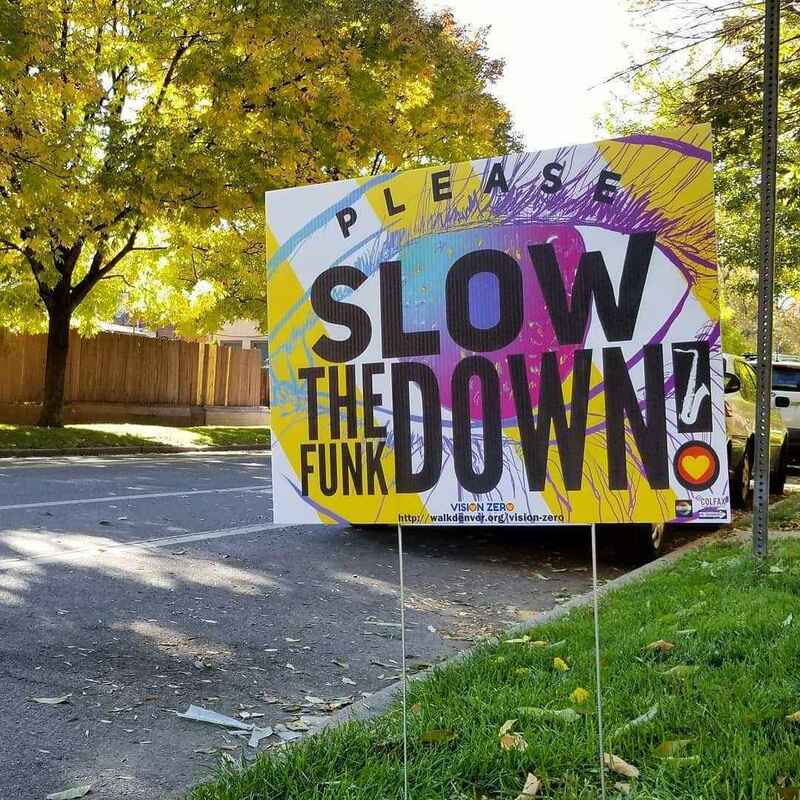 WalkDenver created the "Slow the Funk Down" yard signs as part of our Vision Zero Community Art Project, aimed at raising awareness of Denver's commitment to Vision Zero and the goal of eliminating traffic fatalities. We partnered with local artists at the So-Gnar Creative Division, The Signtologist, and community members to design these colorful signs reminding people to please drive safely. The signs have been so popular, we've already given away more than 700 to residents in neighborhoods throughout Denver. Your donation will help us order additional signs and spread the Vision Zero message in support of safer streets. In addition to donating, you can complete this form to be added to a waiting list to receive a sign once we are able to order more. Thank you for supporting Vision Zero and the goal of eliminating traffic fatalities and serious injuries on Denver's streets! the sign is colorful and might help the speeders back off the gas peddle. Hooray for safer streets and more livable neighborhoods! We need to slow down. There is nothing that is that important to be going 50 in a 25mph.! The best campaign slogan EVER! Thanks for initiating this MUCH NEEDED message throughout our neighborhoods!!!! It's time to slow the funk down! Just tired of drivers who think a stop sign is only a suggestion. People with poor driving skills and inattention to the task at makes life dangerous.